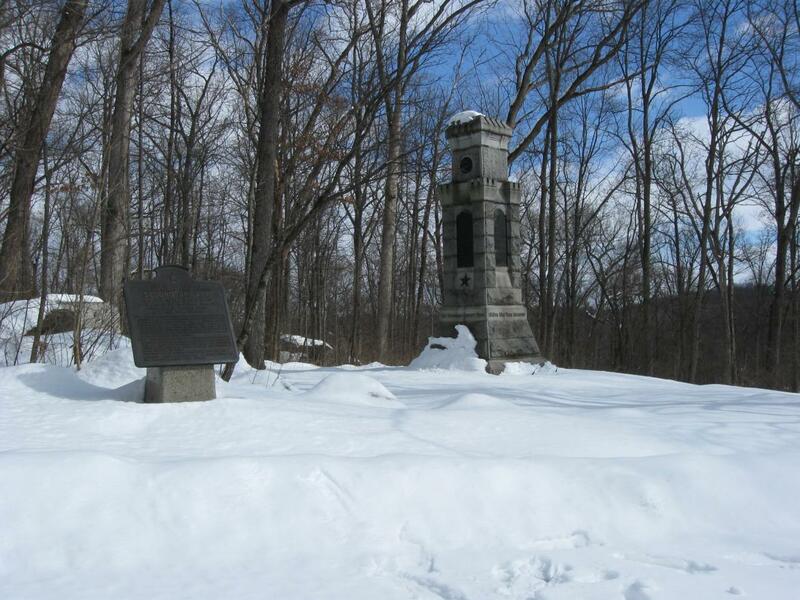 The monument to the 78th and 102nd New York Infantry Regiments is our primary focus, but other landmarks are in view. 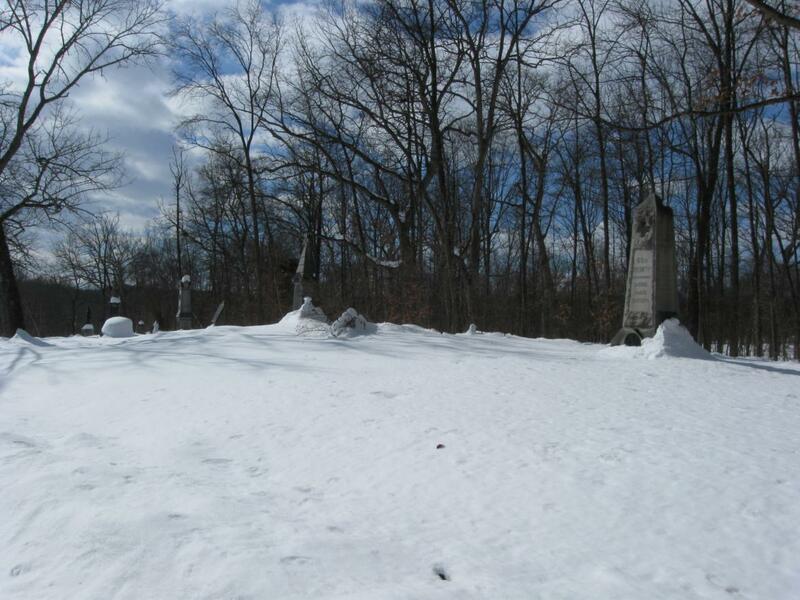 On the far left is the marker to the brigade of George Sears Greene. 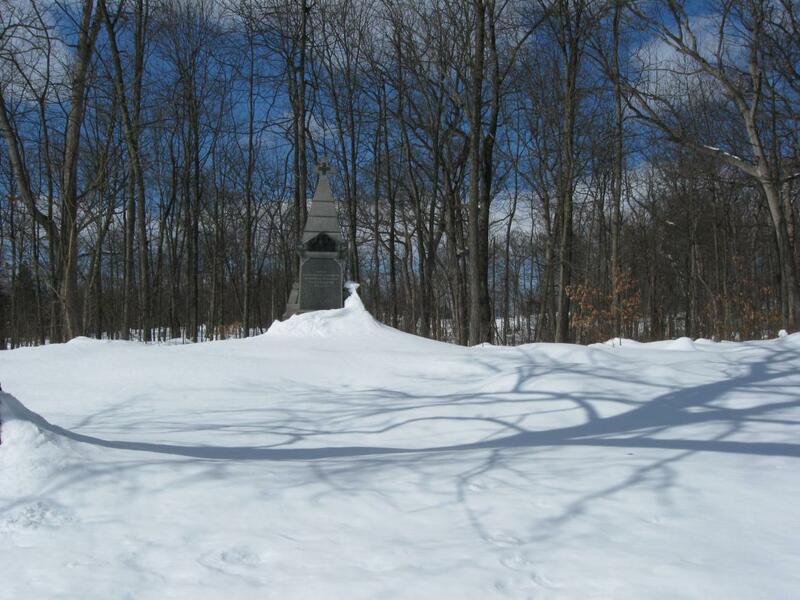 Behind the marker, and mostly hidden by the snow is the monument to the 28th Pennsylvania Infantry Regiment. 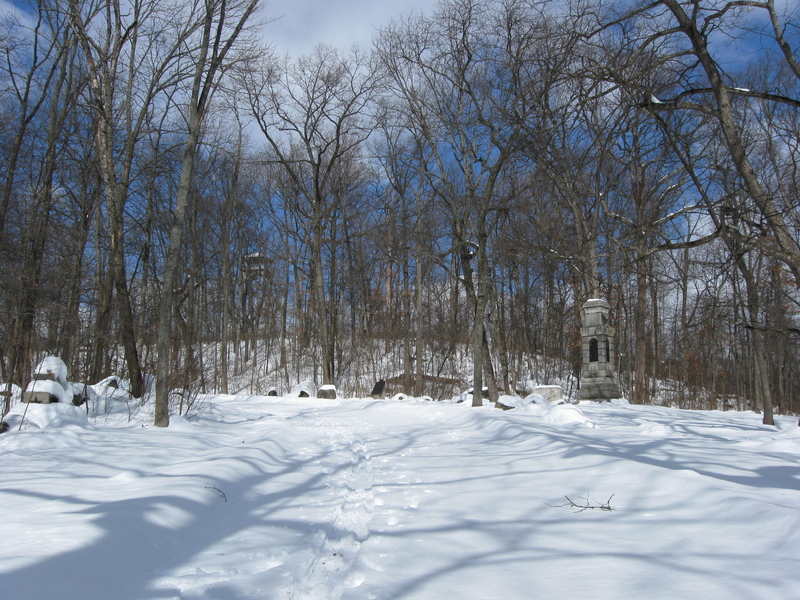 The Culp’s Hill Observation Tower is visible on the summit of Culp’s Hill. 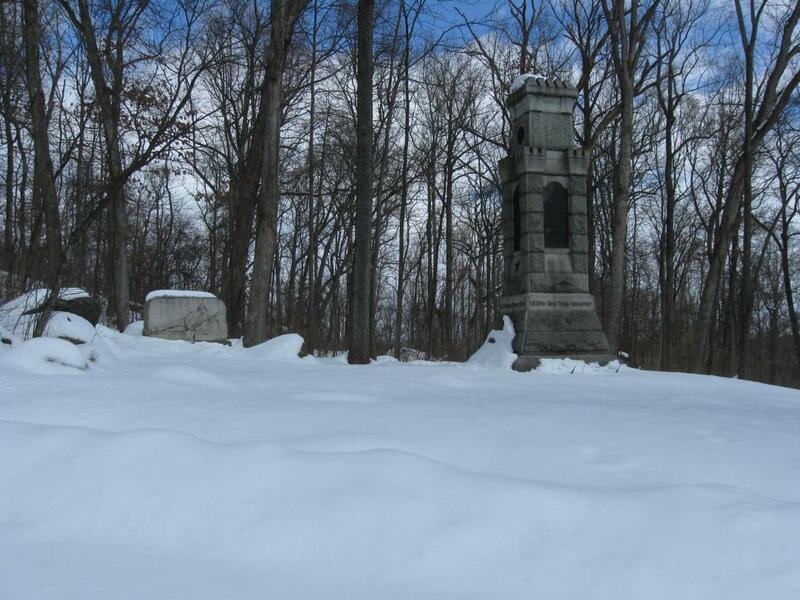 To the left of the 78th/102nd New York Monument is the marker for Lockwood’s Brigade. 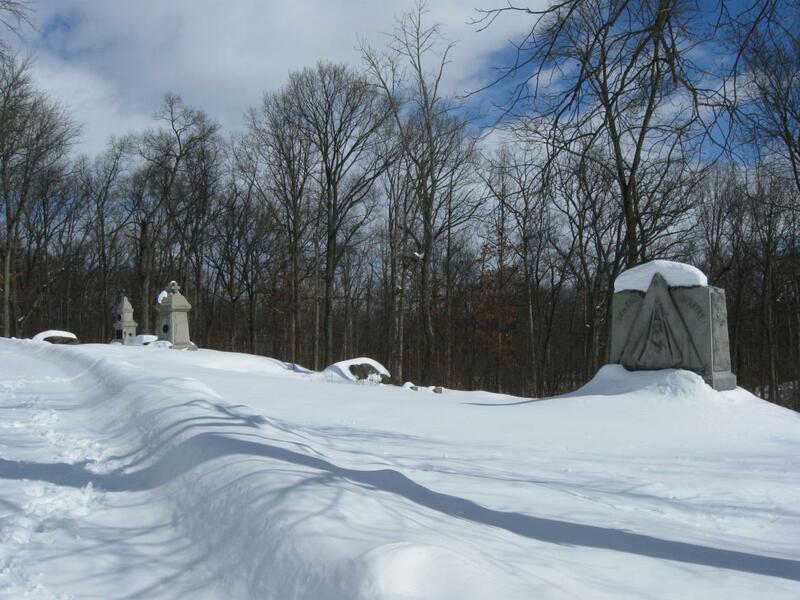 To the right of the 78/102 New York is the monument to the 150th New York Infantry Regiment. This view was taken facing north at approximately 12:00 PM on Sunday, February 14, 2010. The Gettysburg area now has sunshine and highs in the 60s. 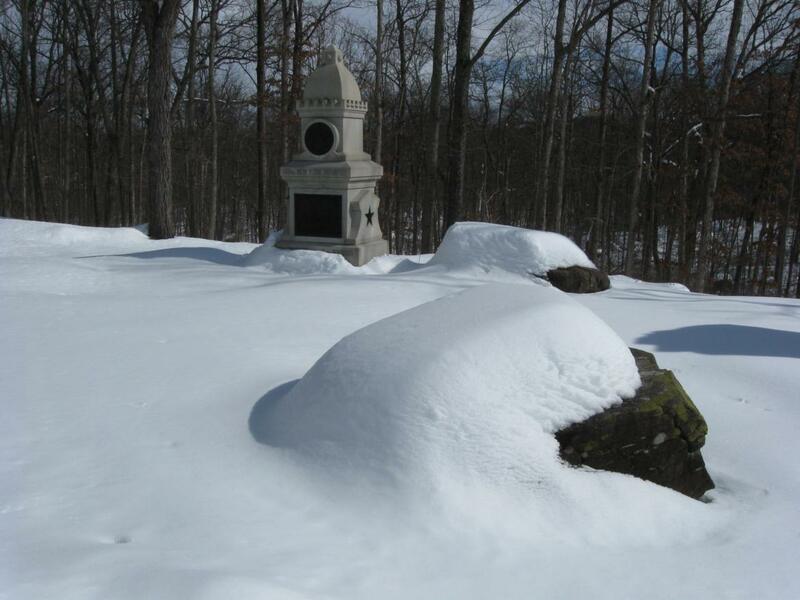 However, before we reach spring later this week, we wanted to take a last opportunity to show you Gettysburg in the snow. 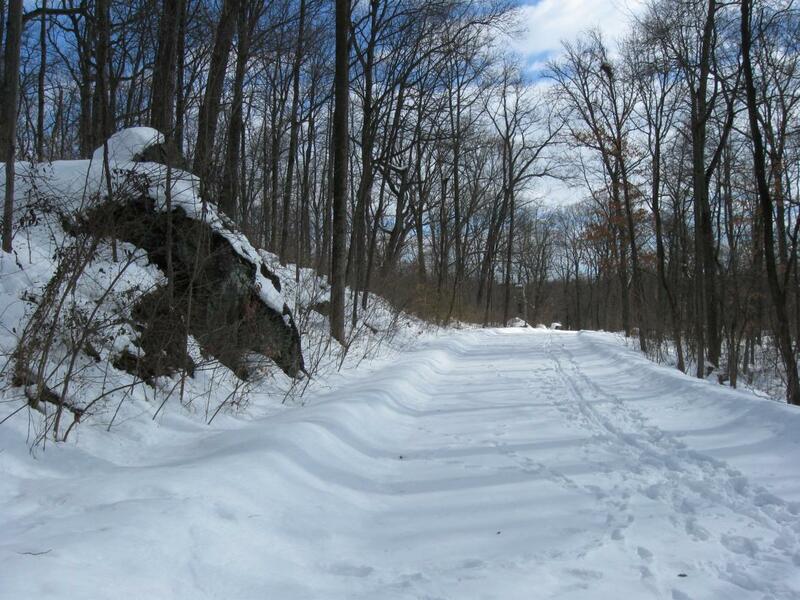 During one of the days before the park roads were cleared we walked to and around Culp’s Hill just to document the appearance of the snow covered landscape. 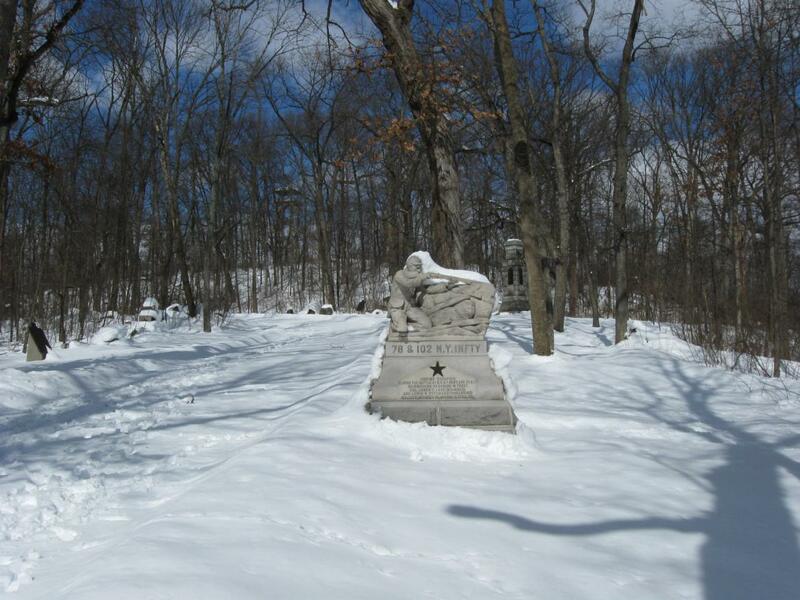 Today we visit the southern slope of Culp’s Hill. 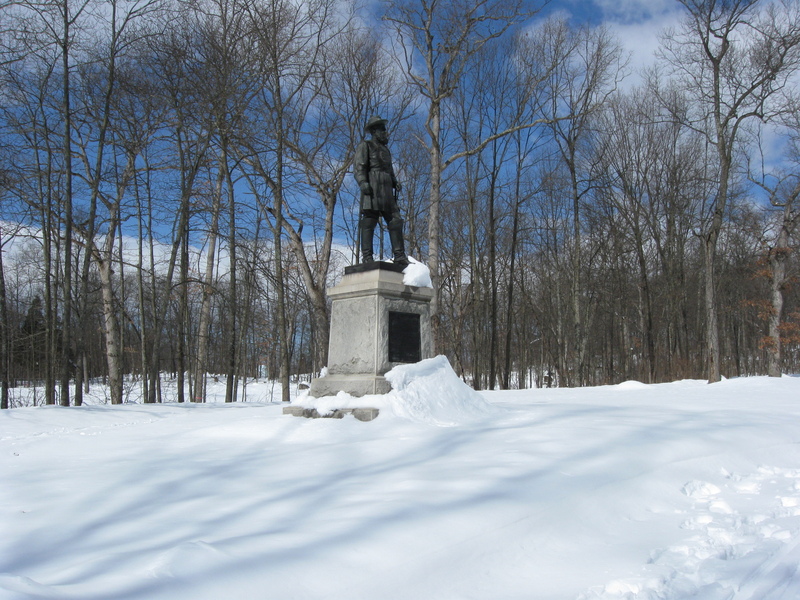 Gettysburg’s February 6th “Blizzard,” the Morning After: Part 1 on February 8, 2010. Gettysburg’s February 6th “Blizzard,” the Morning After: Part 2 on February 9, 2010. Gettysburg’s February 6th “Blizzard,” the Morning AFter: Part 3 on February 10, 2010. 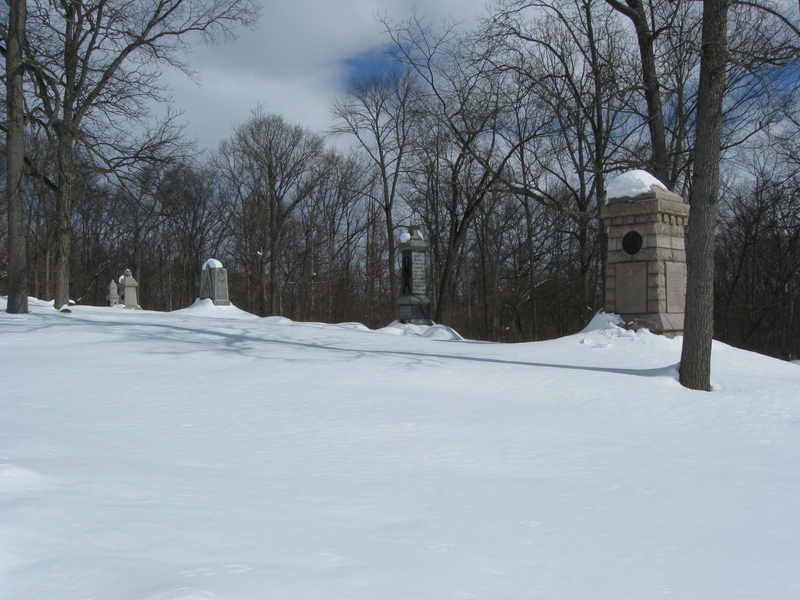 Gettysburg’s February 10th Snow Storm: Cemetery Ridge Part 1 on February 15, 2010. 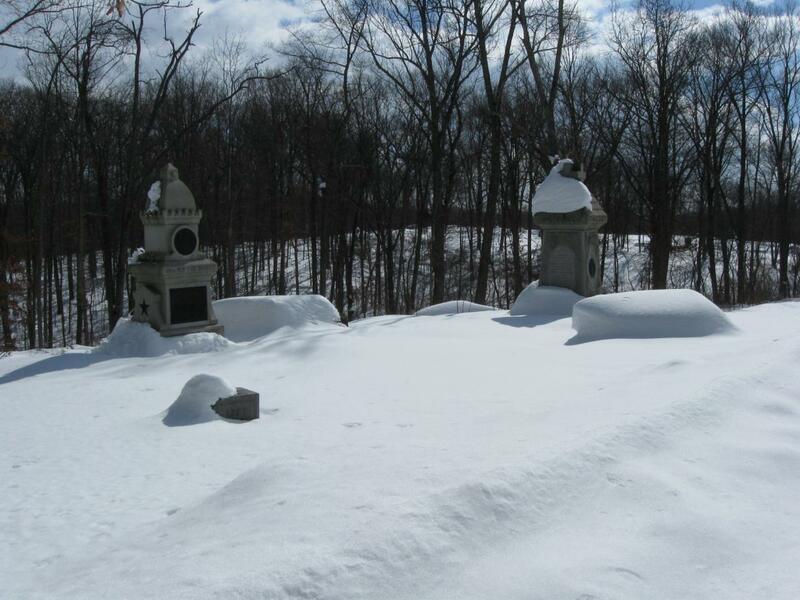 Gettysburg’s February 10th Snow Storm: Cemetery Ridge Part 2 on February 16, 2010. 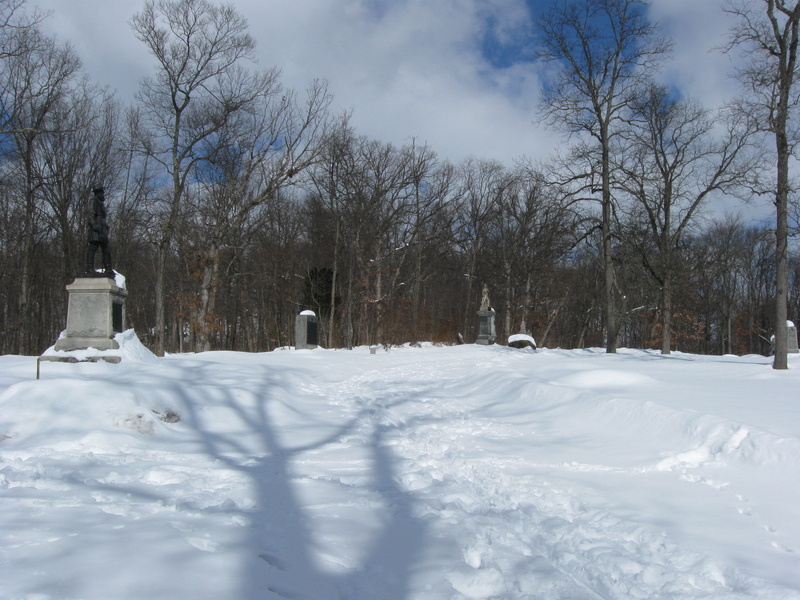 Gettysburg’s February 10th Snow Storm: Cemetery Ridge Part 3 on February 17, 2010. 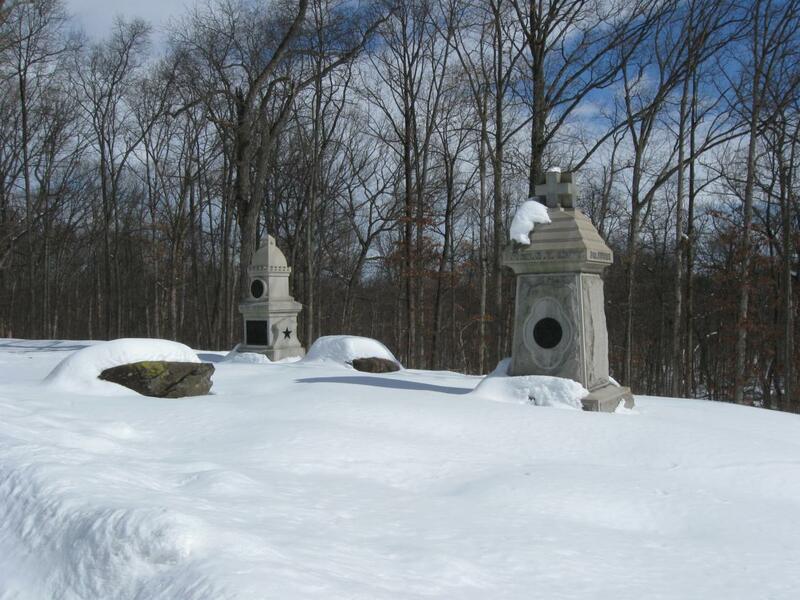 Gettysburg’s February 10th Snow Storm: Cemetery Ridge Part 4 on February 18, 2010. Gettysburg’s February 10th Snow Storm: Doubleday Avenue on February 23, 2010. Gettysburg’s February 10th Snow Storm: Wainwright Avenue on March 16, 2010. 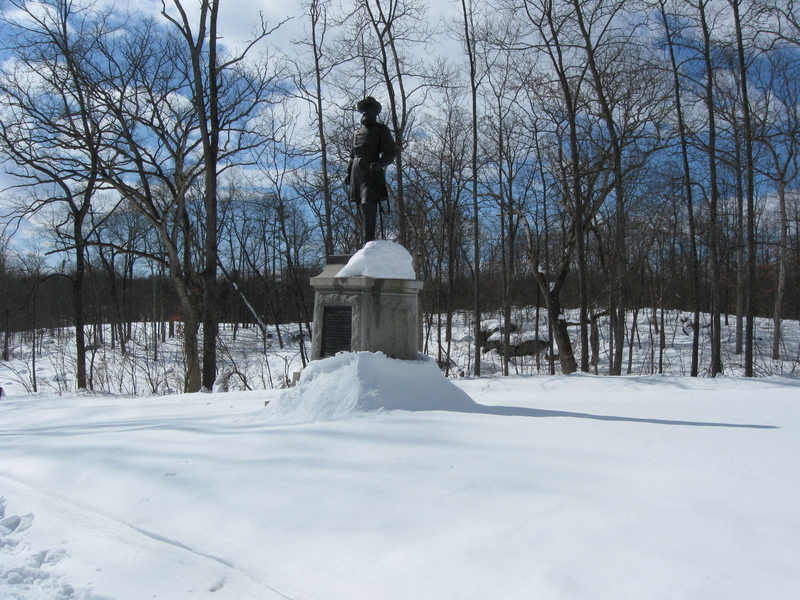 Gettysburg’s February 10th Snow Storm: Stevens’ Knoll and Culp’s Hill Summit on March 17, 2010. Yesterday, we showed you that we had left the summit of Culp’s Hill, and today we are heading for its southern/southeastern slope. We are on the snow covered Slocum Avenue. This view was taken facing southeast at approximately 12:00 PM on Sunday, February 14, 2010. The marker to Henry Lockwood’s Brigade is on the left. The monument to the 150th New York Infantry Regiment is on the right. This view was taken facing northeast at approximately 12:00 PM on Sunday, February 14, 2010. The monument to the 1st Maryland Eastern Shore (USA) is in the left background, and the 150th New York Monument is on the right. 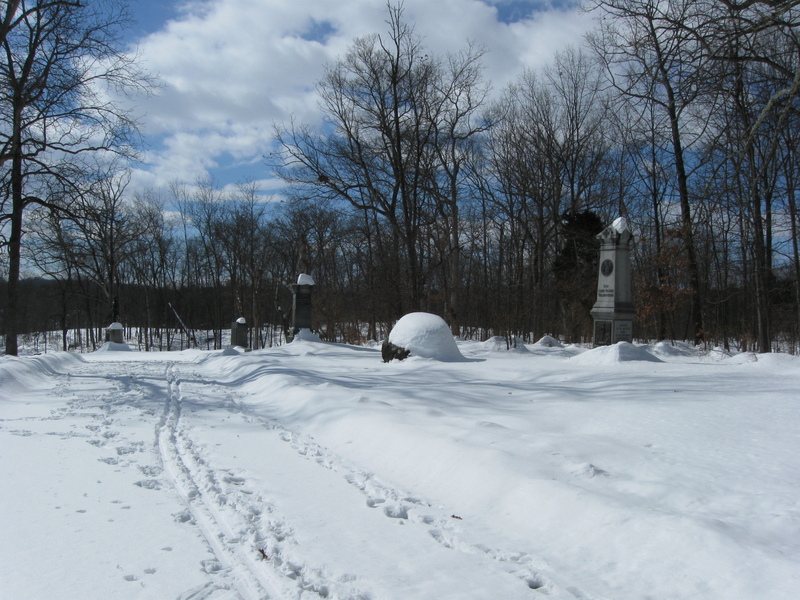 This view was taken facing northeast at approximately 12:00 PM on Sunday, February 14, 2010. We’re continuing down the slope. This view was taken facing southeast at approximately 12:00 PM on Sunday, February 14, 2010. 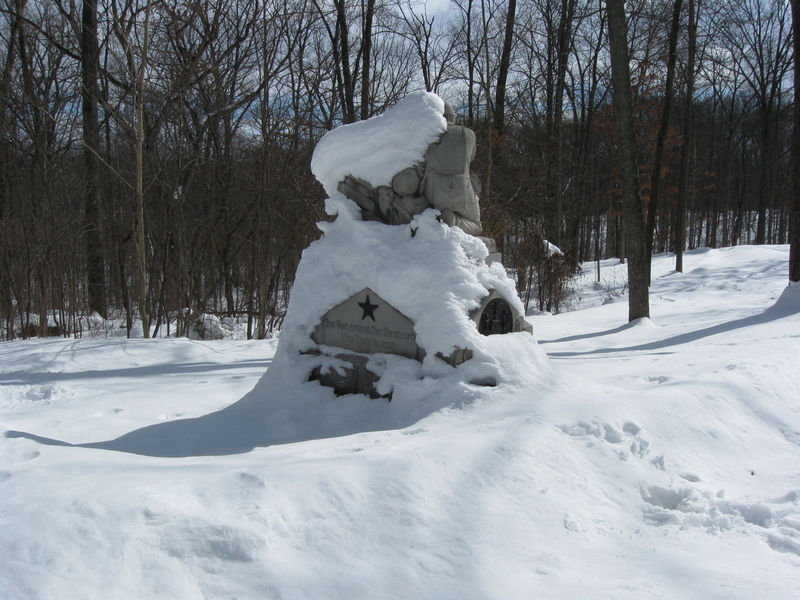 The monument to the 28th Pennsylvania Infantry Regiment. This view was taken facing southwest at approximately 12:00 PM on Sunday, February 14, 2010. A view of the area from which we came. This view was taken facing north at approximately 12:00 PM on Sunday, February 14, 2010. Coming up on the left… This view was taken facing southeast at approximately 12:00 PM on Sunday, February 14, 2010. 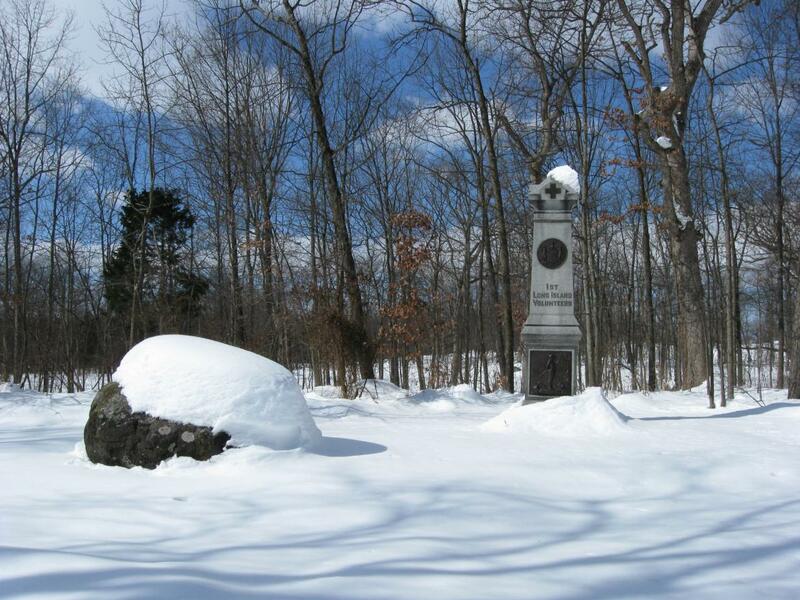 … is the monument to the 78th/102nd New York Regiment. This view was taken facing southeast at approximately 12:00 PM on Sunday, February 14, 2010. The monument was dedicated on July 2, 1888. 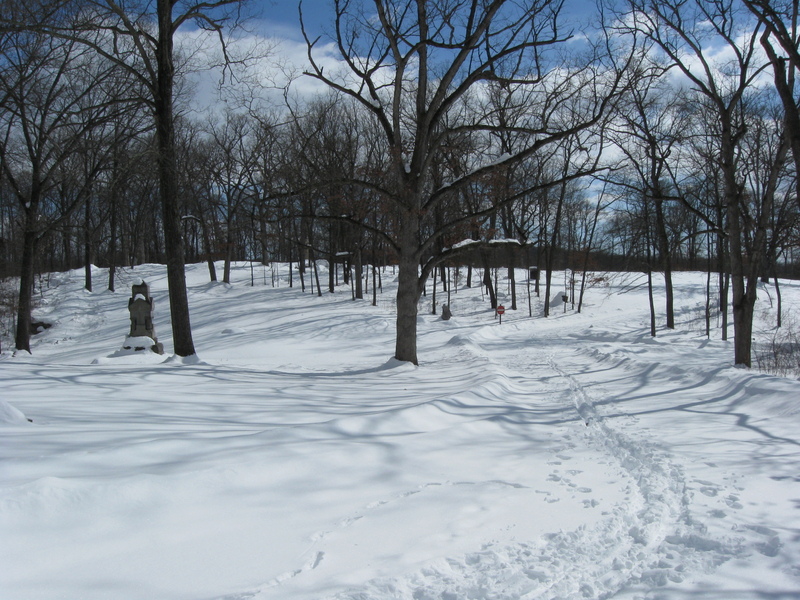 This view was taken facing northeast at approximately 12:00 PM on Sunday, February 14, 2010. We’ll show a wider shot here with three different pictures. This view was taken facing north at approximately 12:00 PM on Sunday, February 14, 2010. 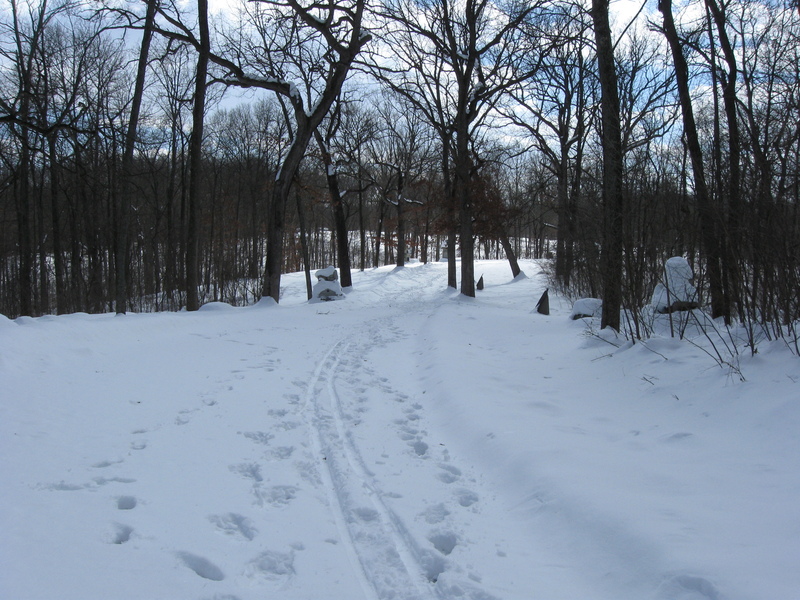 This view was taken facing northeast at approximately 12:00 PM on Sunday, February 14, 2010. 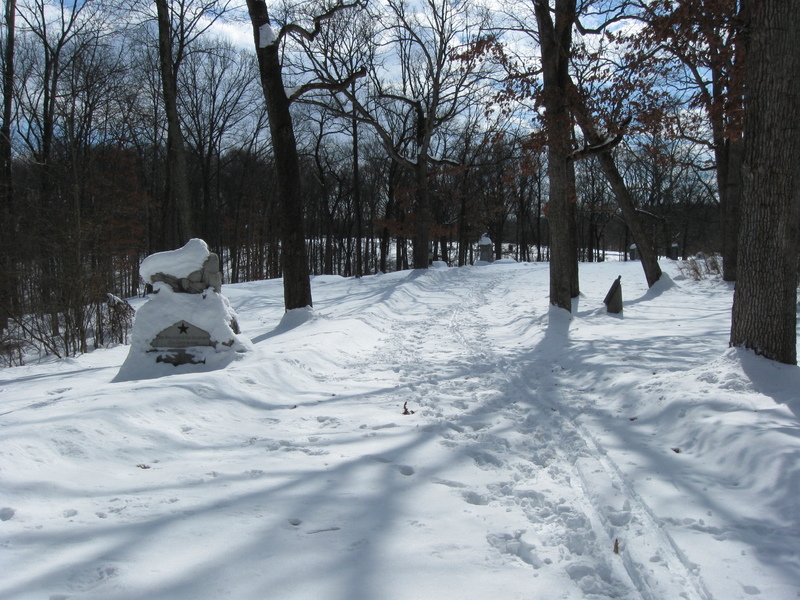 The reconstructed earthworks, located to the right of and near the shadow of the tree is well hidden by the snow. 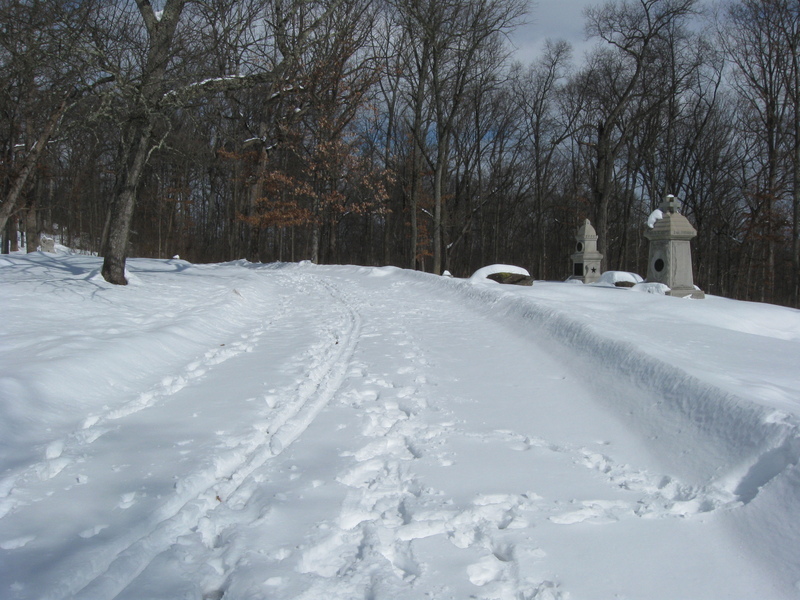 This view was taken facing northeast at approximately 12:00 PM on Sunday, February 14, 2010. Again looking at the area from which we came. This view was taken facing north at approximately 12:00 PM on Sunday, February 14, 2010. We’re continuing down the slope. 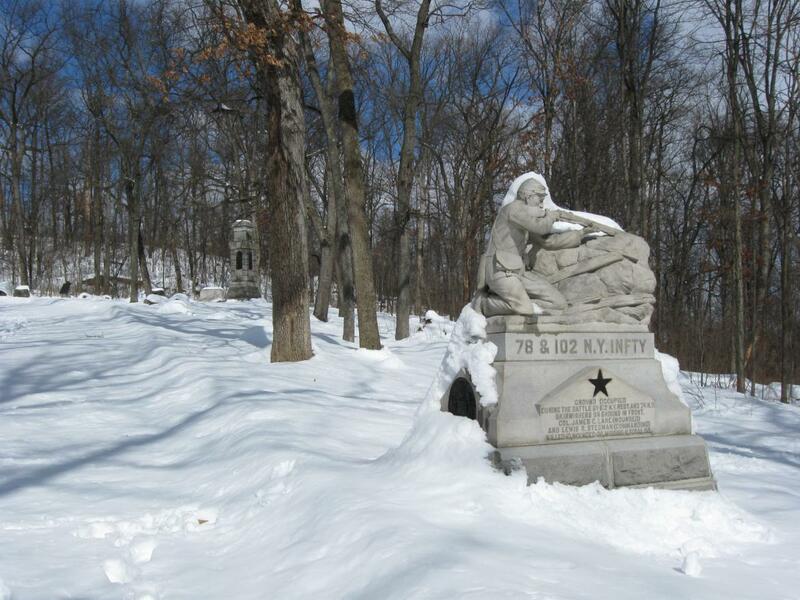 On the right side (west side) of Slocum Avenue are monuments to the 6th Corps. This view was taken facing southwest at approximately 12:00 PM on Sunday, February 14, 2010. Back on the left or east side of Slocum Avenue are the monuments to the 149th New York (left) and the 122nd New York (right). Lower Culp’s Hill/Spangler’s Hill is in the background. This view was taken facing southeast at approximately 12:00 PM on Sunday, February 14, 2010. The monument to the 149th New York was dedicated on September 18, 1892. This view was taken facing northeast at approximately 12:00 PM on Sunday, February 14, 2010. 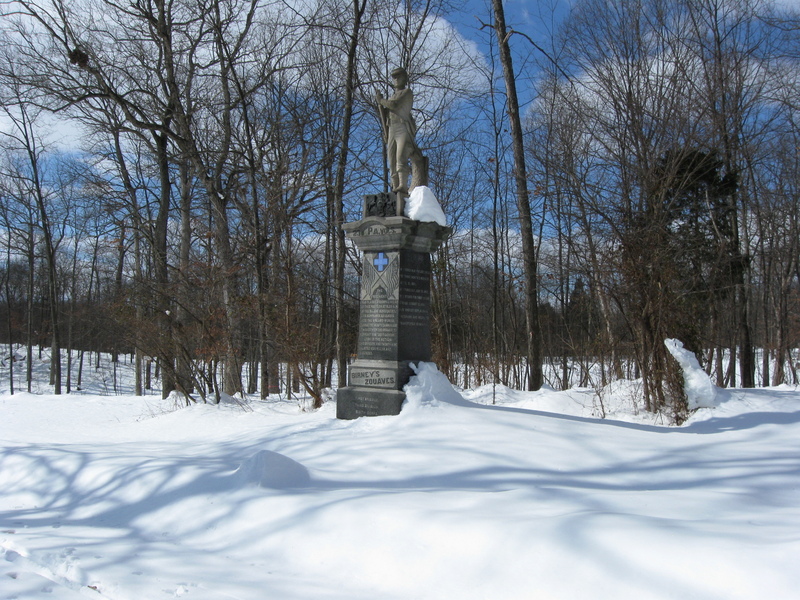 The monument to the 82nd Pennsylvania Infantry is on the west side of Slocum Avenue. This view was taken facing southwest at approximately 12:00 PM on Sunday, February 14, 2010. The 149th New York was in the 12th Corps, and the 122nd New York was in the 6th Corps. 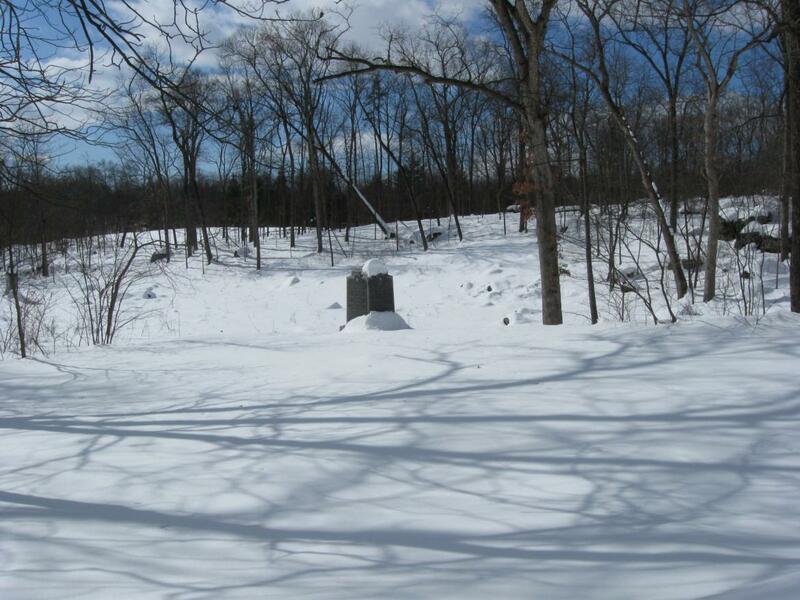 This view was taken facing northeast at approximately 12:00 PM on Sunday, February 14, 2010. Continuing down the slope. This view was taken facing southwest at approximately 12:00 PM on Sunday, February 14, 2010. 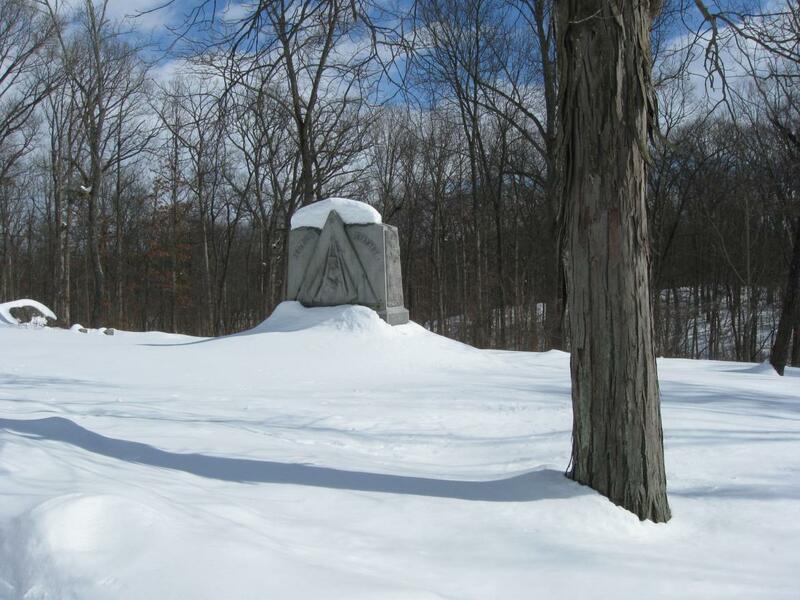 The monument to the 1st Long Island, also known as the 67th New York Infantry Regiment. This view was taken facing southwest at approximately 12:00 PM on Sunday, February 14, 2010. The monument to the 78th/102nd New York is barely visible in the left background. The monuments to the 149th New York and the 122nd New York are in the right background. 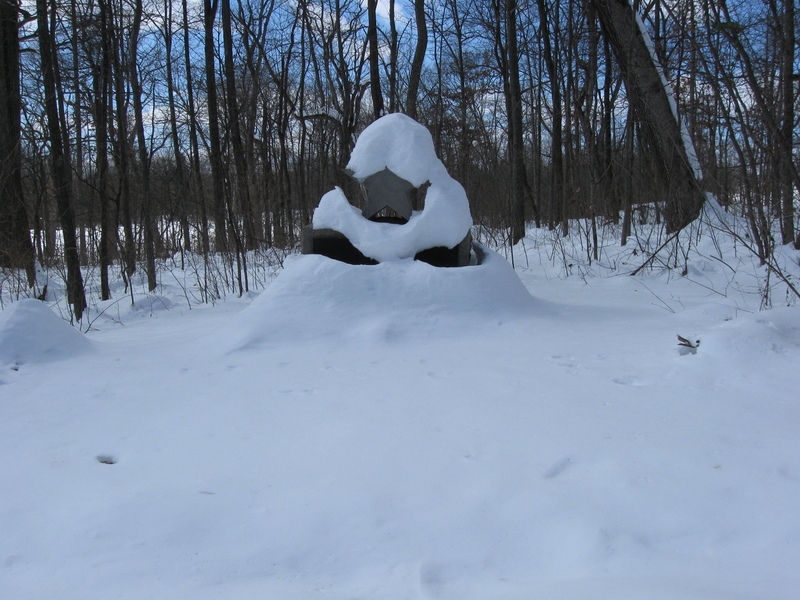 This view was taken facing northeast at approximately 12:00 PM on Sunday, February 14, 2010. 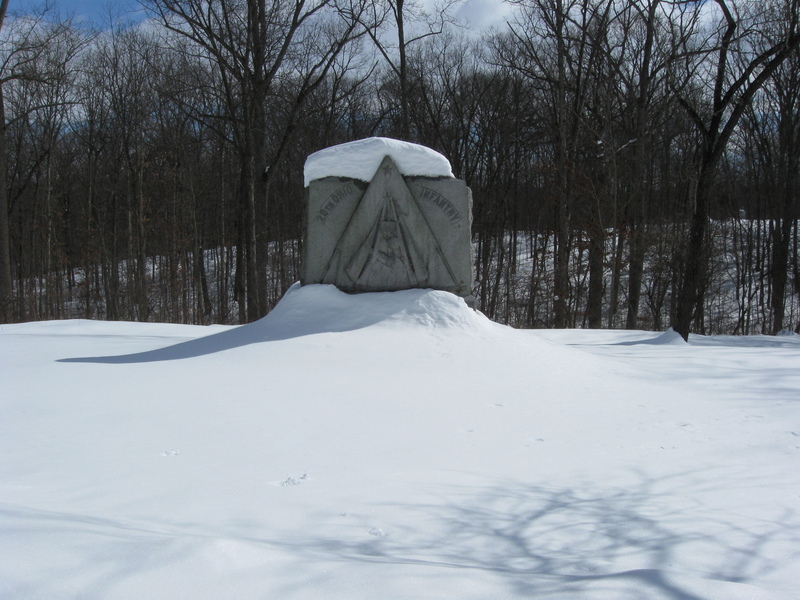 The monument to the 29th Ohio Infantry. Lower Culp’s Hill/Spangler’s Hill is in the left background. This view was taken facing southeast at approximately 12:00 PM on Sunday, February 14, 2010. The 29th Ohio Monument was dedicated on September 14, 1887. This view was taken facing southeast at approximately 12:00 PM on Sunday, February 14, 2010. 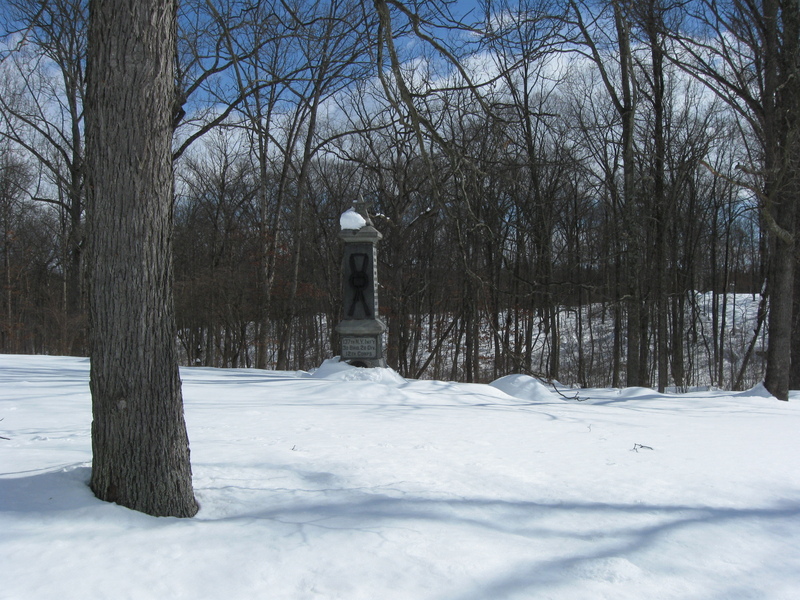 The monument to the 23rd Pennsylvania Infantry regiment, on the west side of Slocum Avenue… This view was taken facing southwest at approximately 12:00 PM on Sunday, February 14, 2010. … west dedicated on June 12, 1888. This view was taken facing northwest at approximately 12:00 PM on Sunday, February 14, 2010. 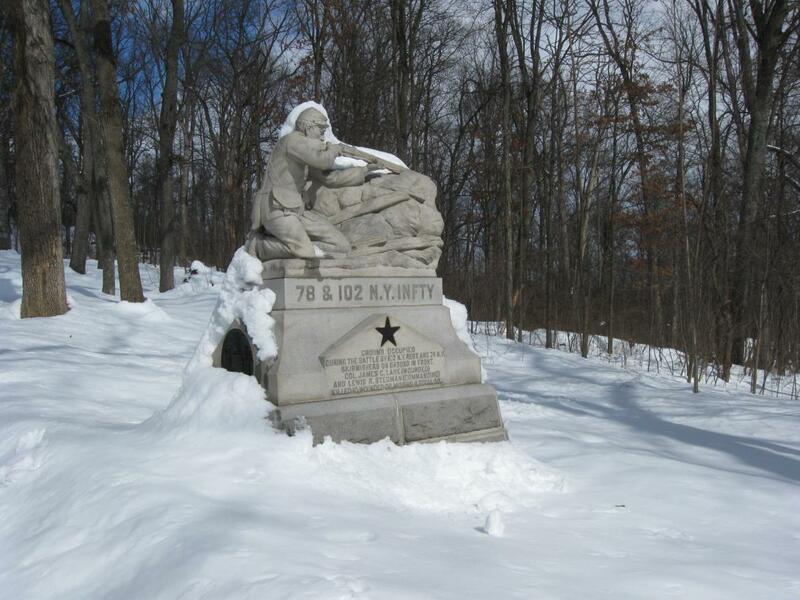 The monument to the 137th New York Infantry Regiment. This view was taken facing southeast at approximately 12:00 PM on Sunday, February 14, 2010. 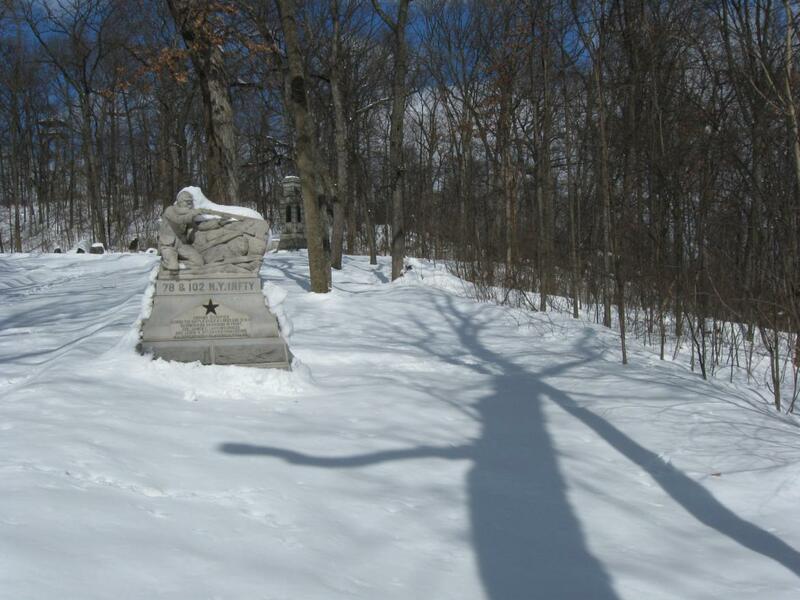 The monument to the 7th Ohio Infantry Regiment. This view was taken facing southeast at approximately 12:00 PM on Sunday, February 14, 2010. 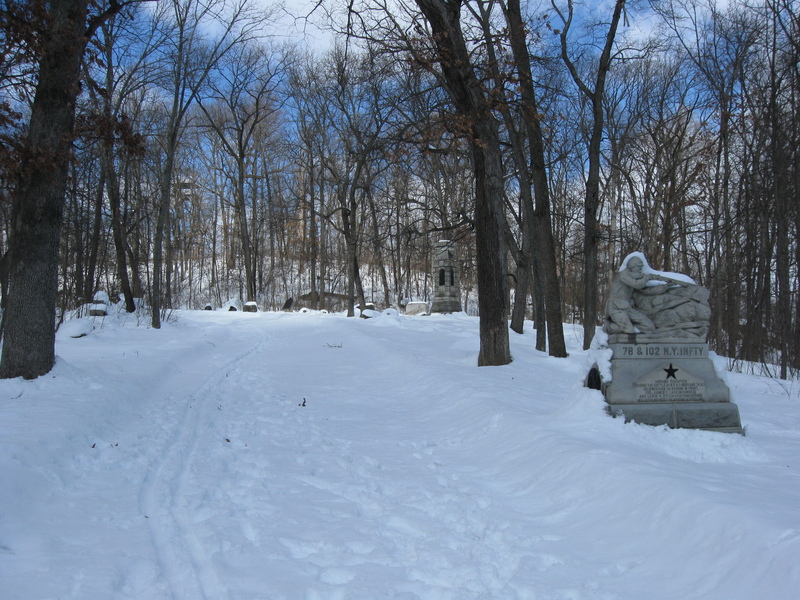 The monuments on the east side of Slocum Avenue. This view was taken facing northeast at approximately 12:00 PM on Sunday, February 14, 2010. 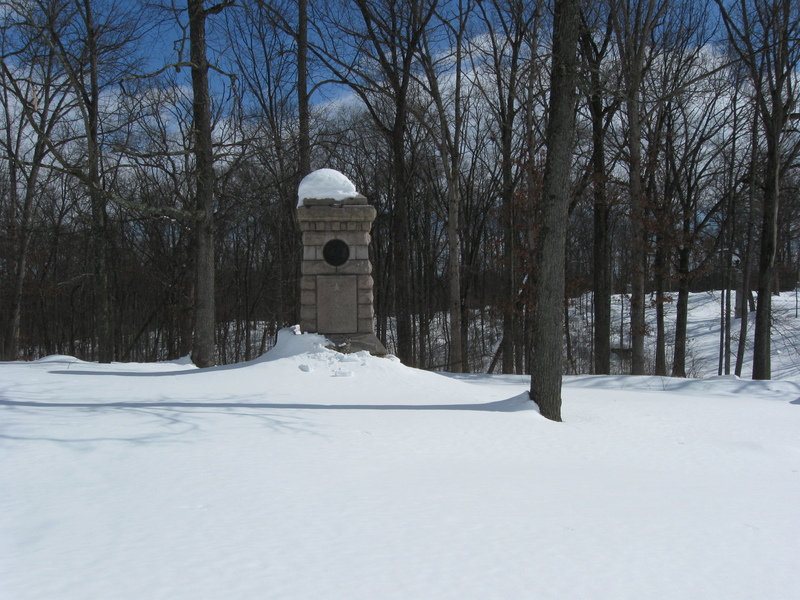 The monument to Brigadier General John White Geary was erected in the autumn of 1914… This view was taken facing southwest at approximately 12:00 PM on Sunday, February 14, 2010. …but not dedicated until August 11, 2007. This view was taken facing northwest at approximately 12:00 PM on Sunday, February 14, 2010. 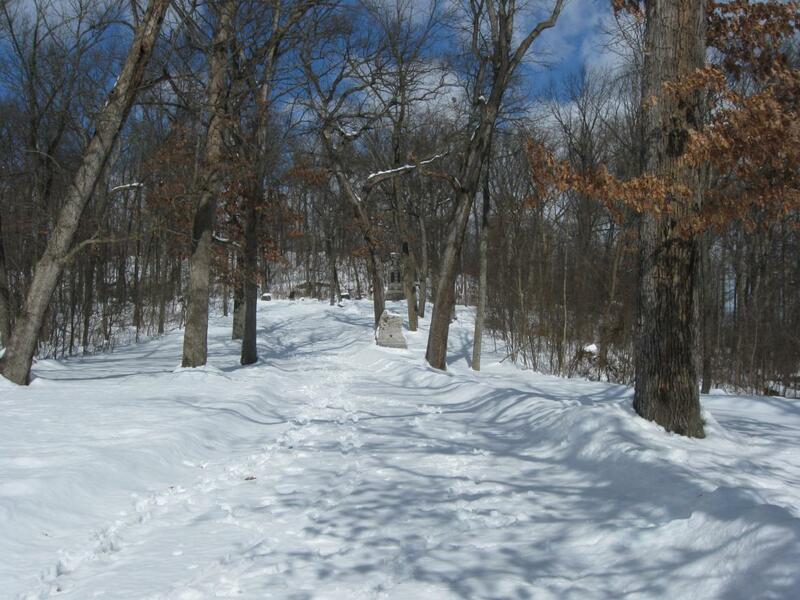 Continuing towards Lower Culp’s Hill/Spangler’s Hill. This view was taken facing southeast at approximately 12:00 PM on Sunday, February 14, 2010. 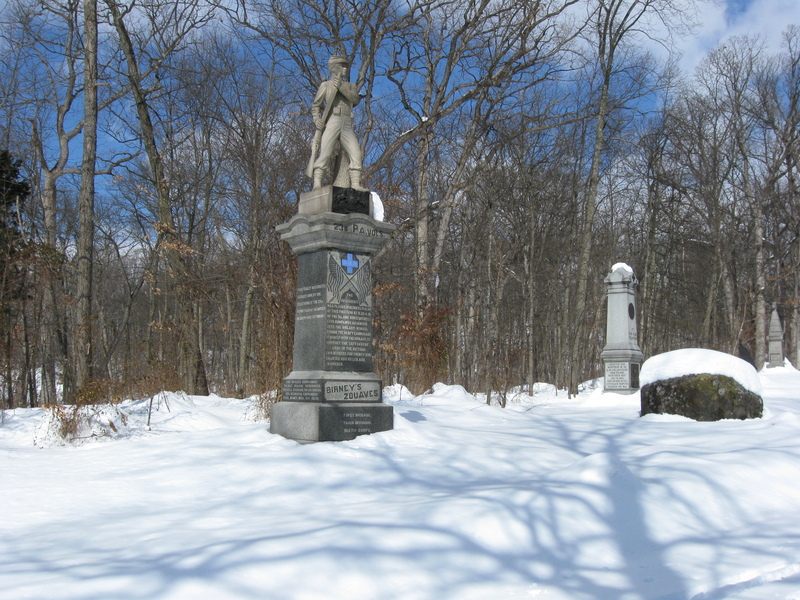 On the west side of Slocum Avenue is the first monument to the 29th Pennsylvania Infantry Regiment, dedicated on July 3, 1885. This view was taken facing west at approximately 12:00 PM on Sunday, February 14, 2010. One final look at the direction from which we came. This view was taken facing northwest at approximately 12:00 PM on Sunday, February 14, 2010.